Welcome to the Holiday Inn Washington-Capitol, winner of the IHG 2007 Quality Excellence Award We offer the ideal location for travelers coming to Washington, DC. We are conveniently located one block from the National Air & Space Museum, the most visited museum in the world. Walk to Washington&regs area attractions including the White House, Smithsonian museums, Washington Monument Holocaust Museum, World War II Memorial, and the US Capitol Building. This Washington DC hotel is just minutes from FEMA, HUD, DOT, USDE, USDA and HHS. With free high speed wired/wireless Internet access throughout, you will stay connected. Maintain your exercise regimen in our 24 hour, state-of-the-art aerobic fitness center. All hotel rooms are now equipped with refrigerators. 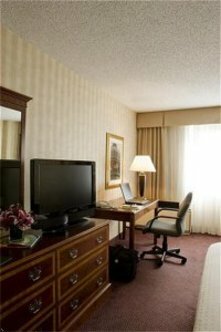 Our superb location, friendly service and refrigerators in all rooms, makes the Holiday Inn Washington - Capitol the best hotel choice for business and leisure travelers alike. Enjoy a hearty breakfast at Smithson's Restaurant, where Kids Eat Free or grab a freshly baked muffin at the Shuttle Express Deli or coffee from our Starbucks. After a long day, unwind in the comfortable surroundings of the 21st Amendment Bar & Grill or take a relaxing swim in our seasonal rooftop pool overlooking the Capitol. Make the Holiday Inn Washington-Capitol your first hotel choice when traveling to the Washington area This hotel is committed to providing accessible facilities under the American Disabilities Act. If your accessibility needs are not met, please contact the Hotel Manager on Duty. Should you require additional information regarding accessible facilities for guests with disabilities, please call 1-800-Holiday (U.S. and Canada) or contact the hotel directly. For the hearing impaired, TDD service is available at 1-800-238-5544 within the U.S. and Canada.